How is it that alligators are deadly accurate hunters, even on the darkest nights when their prey makes no sounds? The answer to that are dome pressure receptors, highly sensitive small black dots that pepper the sides of their face, first described by Von During (1974), which act much in the same way as whiskers do on a cat (Soares, 2002; Leitch & Catania, 2012). As soon as an unsuspecting animal disturbs the water to get a drink, these invisible whiskers detect the tiny waves they create and the alligator can strike having neither seen nor heard the animal. While we can see and count these dots in living alligators, what about in their ancestors? When did this specialized sense first appear? Before we can determine if fossil crocodyliforms may have had these dome pressure receptors (DPRs), which are a soft tissue structure, we first need to look for some feature on the skull associated with them. Just like in humans, the face of the alligator gets its sensation from the trigeminal nerve (CNV). This nerve supplies sensation to the face of all vertebrates and evidence suggests that it is larger when there are specialized receptors present like whiskers or DPRs. This large nerve also has a large hole in the skull associated with it, the trigeminal fossa, which we can measure in living alligators and fossil crocodyliforms. Therefore this hole in the skull is an excellent place to measure the nerve that supplies the DPRs because it is present in both living alligators as wells preserved in fossils. Our recent article in the Anatomical Record explores the trigeminal DPR system through an anatomical investigation of a range of different sized alligators, a few crocodiles and some fossil crocodyliforms. We CT scanned alligator heads to get volumetric measurements, dissected them to better understand the anatomy of the trigeminal nerve, and finally histologically sampled the nerve to measure how many fibers were in it. This latter part helped distinguish the relative contributions of motor versus sensory portions of the nerve. Our findings show that the trigeminal nerve scales with skull size in the alligator as well as with brain size, an important factor when measuring nervous tissue. Together with data we took from the skulls of fossilized crocodyliforms comparing the relative size of the trigeminal fossa and the maxillomandibular foramen in the skull to the overall size of the skull and brain, we can now get a good idea of relative face touch. Integrating these data with perhaps integumentary osteological correlates may then give us a good idea about DPR evolution. This important new tool can give us new information about the habitat these extinct crocodyliforms may have lived in. If the trigeminal fossa in an extinct croc is substantially smaller than that of a living crocodylian, it may not have had DPRs or at least have had a less-sensitive face. This has bearing on the animal’s relationship with its environment and certainly can be applied to other taxa that have well encrusted trigeminal fossae. Leitch DB, Catania KC. 2012. 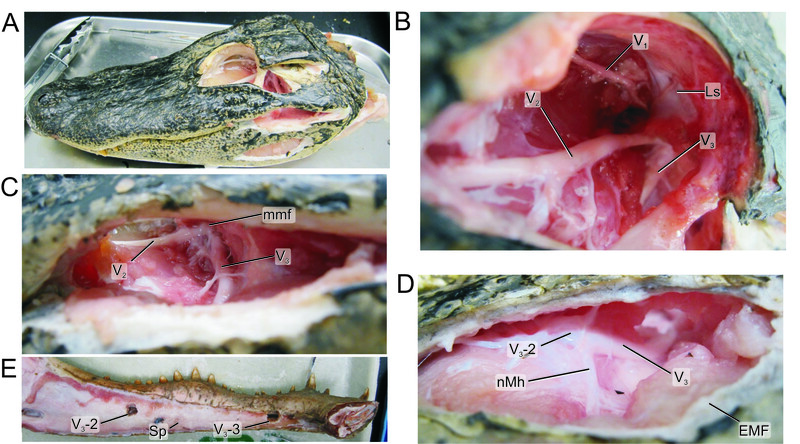 Structure, innervation and response properties of integumentary sensory organs in crocodilians. Journal of Experimental Biology 215:4217–4230. Soares D. 2002. An ancient sensory organ in crocodilians. Nature 417:241–242. von During M. 1974. The ultrastructure of the cutaneous receptors in the skin of Caiman crocodilus. Abhandlungen Rhein.-Westfal. Akad 53:123–134. The video is also very well done. Of course we have no evidence of filamentous structures among the crocodylomorphs, but this depression on the nostril, and the associated groove, suggest that there is some richly innervated soft tissue there, and a sensory function is not impossible, Your paper point precisely on it! Doug, yes I remember talking about that with you in Argentina. But for real, let’s get some ganglia of Baursuchids and see what comes of it? Its testable! Knowing how to create ezine articles and follow their example. Your research as well as the writing process takes some time and effort so make each effort count for something.